In a recent interview, Dr. Gupta discussed the cause of biliary pain, which can occur even after gallbladder surgery. He notes that with advances in technology, techniques and treatments, most patients can be effectively treated with medication and endoscopic procedures. Biliary pain is an abdominal pain. It is caused by an increased pressure within the gallbladder, or the gallbladder "pipes", which are known as the bile ducts. Biliary pain is experienced as sharp pain which typically can last from one to eight hours. Yes. It is believed that in the United States, as many as 10 to 20% of the adult population, mostly females, may suffer from biliary pain. Can biliary pain exist even after the gallbladder has been removed? Yes. And furthermore, the success rate of diagnosis and treatment of biliary pain is likely to be greater in this subgroup of patients, because proof already exists that the gallbladder was sick. This strengthens our biliary pain diagnosis. Assuming that biliary pain is not caused by an inflammation or infection, which are outside the scope of this article, there are several possible causes. 1. Lack of coordination in the various muscle functions within the bile ducts and gallbladder. 2. Either spasm or partial blockage of the sphincter of oddi. This is basically a door or exit through which bile flows from the biliary duct into the small intestine. 3. Bad Bile. That is, bile that does not contain enough bile salts. Bile salts assist in cleaning off fat, and aiding digestion. How do you diagnose biliary pain? There are several different methods used to diagnose biliary pain. They may be used separately or in combination. 1. Ultrasound to look for either stones or indirect evidence of blockage which will cause the bile ducts to dilate, or become larger than normal. 2. Biliary scan – this is a nuclear medicine test which looks for muscle laziness or incoordination, or subtle blockages in the biliary pipes. This is useful when ultrasound is inconclusive. 3. CT scan – this is used to rule out any cancer or mass lesion within the abdomen which could be mimicking biliary pain. 4. ERCP. This technique is a combination x-ray and endoscopic technique to closely examine the gallbladder and bile ducts. Dr. Gupta has been performing this technically complex procedure for several years. How do you treat biliary pain? One or a combination of the following techniques may be used to treat biliary pain. All use endoscopic techniques to avoid open surgery. 1. In recent years, advances have been made to cut open narrow or scarred down sphincter of oddi. This technique is referred to as papiellotomy. 2. 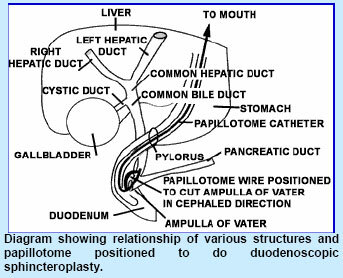 The narrow bile duct can be stretched open with a balloon by a process called dilation. This is similar to a balloon angioplasty for the heart. 3. A pipe or stent may be inserted within the bile duct to keep it from narrowing again. 4. Finally, if the gallbladder is found to be diseased, it can be removed through the laparoscope through a process called laparoscopic cholecystectomy, or lapcholy. Most patients can be treated without opening the belly. Bilary pain may have several causes. Using recent technological advances, Dr. Gupta is able to more effectively diagnose and treat this unpleasant pain, bringing relief and peace of mind to the patient.